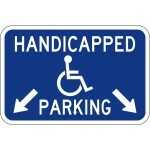 State specific handicap signs come standard on .080 high quality aluminum blanks, available with your choice of reflective sheeting / engineer grade (reflective) / High Intensity (very reflective) / Diamond grade (ultra reflective). We are here to help you get the right sign, post and hardware for your needs. Each state has it's own sign requirements. If you have questions please contact us and we will do our best to help. Signs should be mounted so that the lower edge of the sign is at least five (5) feet above the ground. This helps ensure visibility both for motorists and local enforcement officials. New construction projects must meet minimum standards with very few exceptions; alterations are also subject to strict requirements, although they may be more affected by existing structural conditions. Existing buildings and facilities which are not undergoing planned alterations are viewed a little differently. State and local government agencies that offer programs, services, or activities in existing facilities need to make sure that people with disabilities can gain access and participate in these activities. There are a variety of ways that agencies can ensure access to programs, but making structural improvements is often necessary. The 2010 regulations include a “safe harbor” for features that already comply with the 1991 standards, but may not meet the new 2010 standards. For example: A retail store’s parking lot has a total of 250 parking spaces; in compliance with 1991 standards, the lot includes seven accessible spaces, one of which is van-accessible. The 2010 standards would require two van-accessible spaces, but the store does not have to modify its parking lot to provide the additional space until the lot undergoes a planned alteration (re-striping, re-surfacing, etc.) after March 15, 2012. If the lot is altered after that time, it will then be brought into compliance with the 2010 standards, to the maximum extent feasible. One of every six accessible parking spaces, or fraction thereof, must be “van-accessible.” For example: A parking lot with 400 total spaces needs eight accessible spaces, and two of those eight spaces must be van-accessible. Accessible spaces must connect to the shortest possible accessible route to the accessible building entrance or facility they serve. Parking lots that have four or fewer total spaces do not need to designate the accessible space with a sign. This means that for the purposes of local enforcement (at least in most jurisdictions), anyone, with or without a disability, can park in the accessible space. This is intended to excuse very small entities from having to reserve 25% to 100% of their available parking for individuals with disabilities. Residential facilities where parking spaces are assigned to specific dwelling units are also exempt from the requirement to post signs at accessible spaces. Note that these two exemptions are only related to signs; accessible parking spaces must still be provided in appropriate numbers and with other required features (minimum width, etc.). It is important that accessible features be maintained, and outdoor spaces can be especially challenging because of weather and other conditions. Accessible parking spaces, aisles, and routes should be maintained in good repair and kept clear of snow, ice, or fallen leaf build-up. 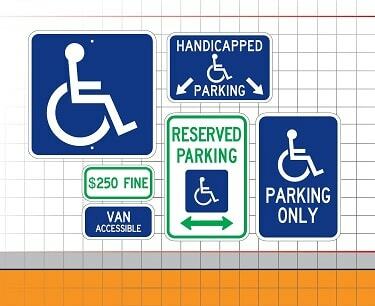 The ADA establishes these requirements to ensure that when parking facilities are provided by entities covered by Title II or Title III, accessible spaces with certain features are available. Many state and local governments have their own requirements, which may be more specific or more stringent in some ways. Each state also establishes criteria and procedures to issue accessible parking permits (often in the form of distinctive license plates or placards) to individuals with disabilities. Enforcement activities related to these issues (fraudulent use of permits, illegal parking in accessible spaces, etc.) are typically carried out by state and local authorities, such as city police departments. Other requirements may be relevant in different situations or under different laws. For example, the Fair Housing Act requires covered housing providers to make “reasonable accommodations” for residents with disabilities, which could mean reserving a parking space for a specific individual.